On July 7, G20 leaders will gather in Hamburg for their annual meeting. One likely outcome: another clash over climate change between the host government, Germany, and United States president Donald Trump. As the Chinese did last year, German Prime Minister Angela Merkel has prioritised climate on the G20 agenda, just when the US administration is rolling back many environmental policies. President Trump has announced that he wants his country to leave the Paris agreement, saying that the international accord is unfair to the US. The question of what is fair in climate politics is hugely important. Trump’s definition of fairness – “America First” – is probably not mutually acceptable to most other nations. But countries will hesitate to scale up their ambitions unless they are convinced that others are doing their fair share. To address this question, we have put together our third annual stocktake on their progress in a report – coordinated by the global consortium Climate Transparency – that determines how far the G20 has come in shifting from fossil fuels to a low-carbon economy. The report, compiled with 13 partners from 11 countries, draws on a wide spectrum of published information in four main areas (emissions, policy performance, finance and decarbonisation) and presents it concisely, enabling comparison between these 20 countries as they shift from dirty “brown” economies to clean “green” ones. The G20 is crucial to international action on climate change. Together, member states account for 75 per cent of global greenhouse gas emissions and, in 2014, accounted for about 82 per cent of global energy-related carbon dioxide emissions. All member countries signed on to the 2015 Paris agreement, with its long-term temperature goals of keeping global warming to below 2˚C, ideally limiting it 1.5˚C.. The G20 have also proven to be a nimble policy forum, where soft policy making can happen. And there is less concern than in the past that the group would seek to replace the multilateral process. This means these governments must lead the way in decarbonising their economies and building a low-carbon future. According to the Climate Transparency report, the G20 countries are using their energy more efficiently, and using cleaner energy sources. Their economies have also grown, proving that economic growth can be decoupled from greenhouse gas emissions. So we are beginning to see a transition from brown to green. But the report also reveals that the transition is too slow; it does not go deep enough to meet the Paris Agreement’s goals. In half of the G20 countries, greenhouse gas emissions per capita are no longer rising. A notable exception is Japan, where emissions per person are ticking upward. Canada has the highest energy use per capita, followed by Saudi Arabia, Australia and the US. India, Indonesia and South Africa all have low energy use per capita (India’s per capita rate is one-eighth that of Canada). Poverty in these countries can only be addressed if people have access to more energy. Today, renewable energy is increasingly the cheapest option. Still, we found that many G20 countries are meeting their increasing energy needs with coal, the dirtiest of fossil fuels. According to the Climate Action Tracker, which monitors progress toward the Paris agreement’s temperature goals, coal should be phased out globally by 2050 at the latest. Between 2013 and 2014, the G20 countries’ public finance institutions - including national and international development banks, majority state-owned banks and export credit agencies - spent an average of almost US$88 billion a year on coal, oil and gas. Yet many of the G20 countries are now looking at phasing out coal, including Canada, France and the UK, which have all established a plan to do so. 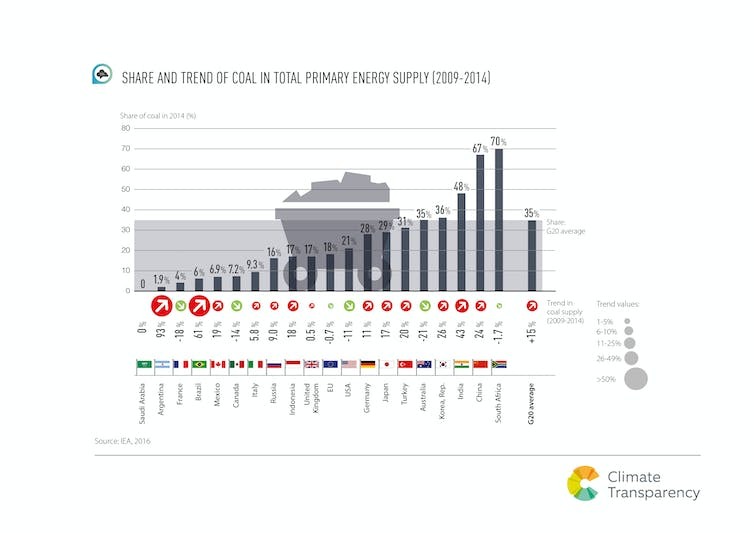 Germany, Italy and Mexico, too, are considering reducing their use of coal or have taken significant action to do so. India and China continue to be highly dependent on coal but have recently closed and scaled back plans for a number of coal plants. Countries at the bottom of the rankings are Japan, Indonesia and Turkey, all of which have substantial coal-plant construction plans, and Australia. We are beginning to see a transition from brown to green. But … the transition is too slow; it does not go deep enough to meet the Paris Agreement’s goals. Despite their repeated commitment to phasing out fossil fuel subsidies, the G20 countries are still heavily subsidising fossil fuels. In 2014, together, the G20 provided a total of over US$230 billion in subsidies to coal, oil and gas. Japan and China provided, respectively, about $US19 billion and $US17 billion a year in public finance for fossil fuels between 2013 and 2014. There is good news, though: renewable energy is on the rise. The G20 countries are already home to 98 per cent of all installed wind power capacity in the world, 97 per cent of solar power and 93 per cent of electric vehicles. In most G20 countries, renewables are a growing segment of the electricity supply, except in Russia, where absolute renewable energy consumption has decreased by 20 per cent since 2009. China, the Republic of Korea and the UK have all seen strong growth. Generally, the G20 countries are attractive for renewable energy investment, especially China, France, Germany and the UK – although the UK has now abandoned its policy support for renewables. National experts asked by Germanwatch, a Climate Transparency partner, generally agree that their respective G20 country is doing quite well on the international stage (with the exception of the US) but lack progress in ambitious targets and policy implementation. China, Brazil, France, Germany, India, Mexico and South Africa are ranked the highest for climate action. Countries with the lowest climate policy performance are the US, Australia, Japan, Saudi Arabia and Turkey. Putting together this G20 stocktake has had its challenges. The choice of indicators involves value judgements, which often become only apparent once national experts begin discussing them. Enabling the international comparisons necessary to measure progress on climate requires information that is accurate, verifiable and comparable. The underlying data comes from very diverse economies with different legal systems, different regulations and reporting methods. International organisations, such as the International Energy Agency, have often done extensive and very careful work to develop comparable data sets but these may not always be consistent with data from in-country sources. Exploring these differences helps us to improve our understanding of the data and the underlying developments. The existing reporting and review system of the United Nations Framework Convention on Climate Change (UNFCCC) is the source of much of the data that makes these comparisons possible. The real challenge the UNFCCC process faces in the next few years as it finalises the “rule book” for the Paris agreement is how to develop an enhanced transparency system that will be robust and detailed enough to provide the relevant information for its five-yearly assessment of global progress on addressing climate. Even so, the UNFCCC is constrained by the extent to which countries are able to see beyond their narrow interests. Independent assessments such as Climate Transparency’s, which remains mindful of different perspectives but is not limited by national interests, can play a vital role in helping to increase the political pressure for effective climate action. Niklas Höhne is Professor of Mitigation of Greenhouse Gases, Wageningen University; Andrew Marquard is Senior Researcher on energy and climate change, University of Cape Town, and William Wills is Research Coordinator, Federal University of Rio de Janeiro. This article was originally published on The Conversation.